This article compares the energy efficiency of a tankless water heater to a conventional storage water heater. Both electric and natural gas units conserve energy, save money, and lower energy bills drastically. Its been estimated that the third largest energy consuming activity in the average home is heating water. It also represents roughly 12% - 14% of all utility expenses: natural gas, electricity, water, etc. Theres a more efficient alternative: the tankless water heater. When you use one, you will save an amazing amount of energy, especially when combined with other residential green energy technologies. The fact that these units consume less natural resources (yes, water as well because the hot water can reach you quicker) make them the green and frugal choice. 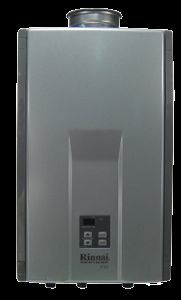 Why are tankless (also known as instantaneous water heaters or on-demand water heaters) so useful? Because a tankless water heater only produces hot water when its asked for. It doesnt demand the wasteful energy usage in the home that conventional water heaters do. Imagine the advantage! Itll save a huge amount of cash on your energy bills over time. Tankless heaters are available for homes with either natural gas or electric hook-ups. Gas tankless heaters present a higher water flow than electric models. But at times the largest gas heater wont supply enough hot water for multiple demands in larger homes. For example, while one person is taking a shower and the dishwasher is running simultaneously, a tankless water heater may be stretched beyond its limits. To remedy this problem, consider connecting two or perhaps three tankless water heaters in parallel to handle simultaneous requests for hot water. Keep in mind that if youre hooking up a natural gas heater, youll need a licensed craftsperson to do the final hook-up. Angies List is a good resource to find one. Find reliable contractors and doctors when you join Angies List today - Use promo code LOCAL to save 15%. How Will a Tankless Water Heater Save You Money? In the first place, a conventional water heater is running 24/7, keeping the water hot consistently. Usually, it gets a heavy load request in the morning because your homes occupants are showering, making breakfast, doing a last minute load of laundry, running the dishwasher, etc. The heater is trying to keep up with demand while maintaining the desired temperature. After everyone has left for the day, its still operating to keep the temperature and level consistent for no reason, except to be ready. And heres the really wrong thing: it continues to waste energy at night while the people sleep. How insane is that? Longevity; it's a Good Thing! Youll also save cash on replacing old units because an on-demand water heater will last at least twenty years. Most of the parts are replaceable. A conventional heater is only good for ten to fifteen years, considering that you maintain it as specified by the manufacturer. Additionally, the true efficiency of a storage heater goes down hill over time because of the honeycomb syndrome caused by internal calcification. How Efficient is a Tankless Water Heater? Consider this, if a home uses 41 or so gallons of hot water per day, a tankless heater can represent 25% to 35% more energy efficiency compared than your conventional storage heater. But if your home uses more hot water each day, say 85 gallons on average, then you should reap 8% to 14% more efficiency. If you install a tankless water heater at each demand spot, your savings are estimated to be 25% to 52%! Does it Make Monetary Sense to Convert to Tankless? This question can only be answered on an individual basis. Many factors figure into the equation. Will energy costs will continue to rise sharply in your area? Thats a fairly safe bet. Whats the total cash expenditure to buy and install tankless heaters in your home? How many years do you expect to stay in your home? These are some of the questions you must consider. Even if you don't expect to live in your home for more than a few years, this might still be a wise investment. In many areas this is a plum when you list your home. Do some homework; ask a few local realtors what the odds are of it being a strong selling point. As with any other hot selling product in the green and sustainable category, many manufacturers are getting into the action and vying for your buck. But hey, that's a good thing. Noritz is a prime supplier of both indoor and outdoor models. They supply from 5.3 up to 13.2 gallons per minute. Stiebel Eltron claims thrir Tempra Series tankless water heater is the "most advanced thermostatically-controlled electric tankless water heater ever made." The Bosch AquaStar 2700ES Direct Vent (Room Sealed Combustion) model can also be mounted outside the home to eliminate venting concerns. It comes with an awesome 12 Year warranty on the heat exchanger! 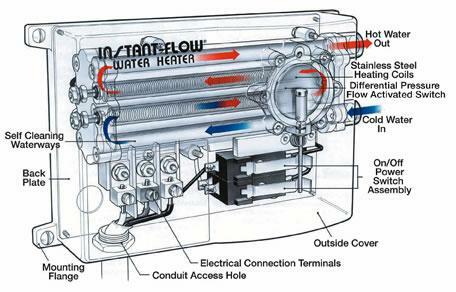 Anyone who listens to talk radio, particularly Rush Limbaugh or Glenn Beck, has heard of Rennai tankless water heaters. All that advertising must have paid off; a new Rinnai is installed somewhere in North America every 3.75 minutes. Other high-quality suppliers are Rheem, Takagi, Aquastar, and Titan.